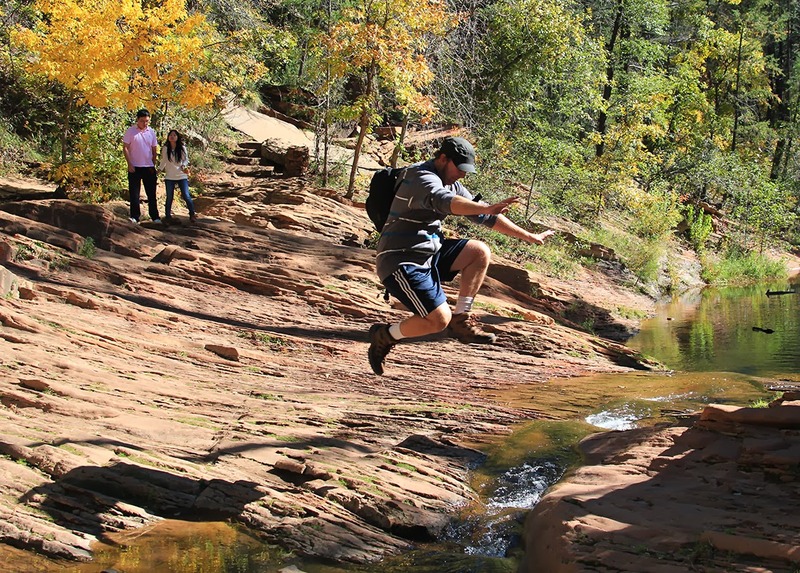 The West Fork Oak Creek is one of the best hikes in Sedona. In fact, I'd say that its one of the best hikes that I've ever done. 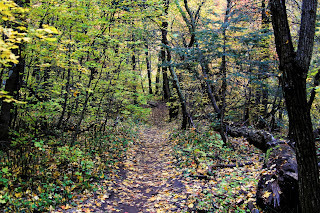 The hike starts in the parking lot just north of the Cave Spring campground on route 89a between flagstaff and Sedona. 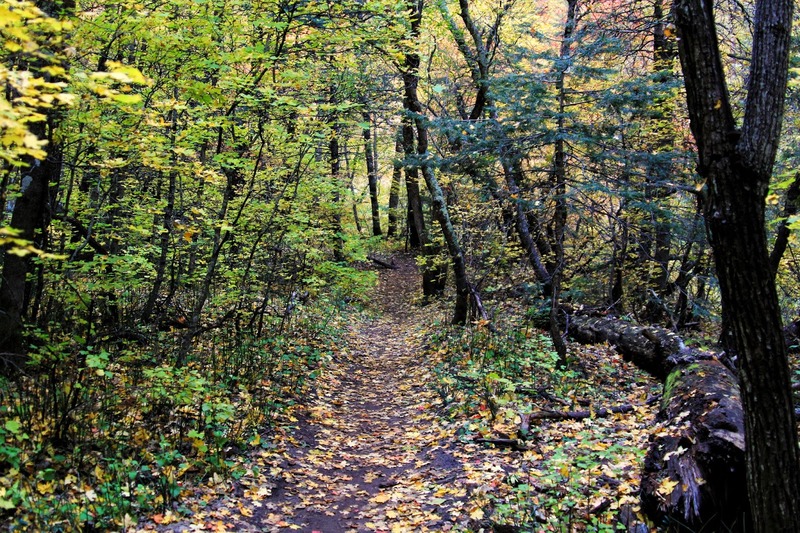 The trail takes you deep into Oak Creek Canyon though a forest worthy of children's book. In the fall, the leaves actually change here. You can expect to see a ton of photographer's in the canyon lugging around expensive gear. The trail will cross over Oak Creek at least 9 times in both directions. There are several swimming holes, but I couldn't handle the cold water for more than a few minutes. As you hike deeper into the canyon, the walls are several hundred feet tall and only about 50 feet wide. 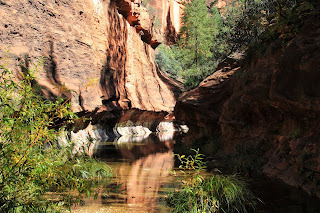 Two miles into the canyon, the trail abruptly stops at natural tunnel similar to the narrows in Zion National Park. From this point, you can continue to hike upstream through the water, or just turn around and head back. Like I said, the water in the creek is brutally cold and proper cold water gear is probably necessary. There are numerous campground located along route 89a between Flagstaff and Sedona. They were all closed on our trip this year because of the government shutdown. 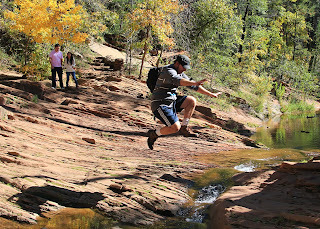 I had originally planned on camping for a night at the Cave Spring Campground, but I had to find a hotel in Sedona instead. In the end, it turned out to be a huge bonus because most of the campgrounds in Oak Creek are located right against the highway. I would have been pissed with all of the road noise at night. I highly recommend staying a night in Sedona. Its easily one of the most beautiful cities in America. We ate a restaurant in town called the Cowboy Club and I had the best cornbread I've ever eaten in my life. The guy at the table next to us ordered the 35$ Elk Chops and the dish was so beautiful that I would have felt bad eating it. My girlfriend's Margarita was so good it was worthy of a ballad. Directions: From route 40 Flagstaff, take route 89a south for approximately 15 miles. Pass the Cave Spring Campground and look for the West Fork Oak Creek parking area on the immediate right. There are several signs at the trail head with maps and descriptions of the trail. Most people hike int the canyon until the trail runs out at the narrow tunnel making this hike 5 miles round-trip.